Sometimes it really pays to have pet insurance. There is a famous saying, “Where there’s a will there’s a way”. This seems to ring true to some pets who manage to destroy the toys that are meant to be “indestructible” and eat the toys that are supposed to be inedible. Roxy is lucky to be alive. She presented to Vet HQ vomiting, inappetant and very flat. Roxy had a history of eating strange things like plastic bags, but this time she outdid herself. The rubber object we removed from her small intestine was so large that it caused the intestine to tear. This allowed food contents from the gut to leak into her abdomen and put her at risk of a life-threatening infection. Luckily we were able to repair the damaged part and with intensive care, she pulled through. 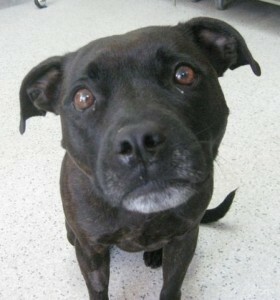 Roxy went home 4 days later and in her owner’s words “her mojo” returned. So what was the foreign object? 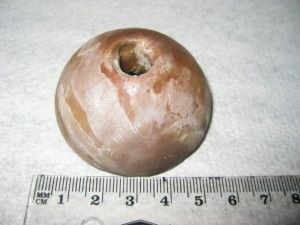 The top of a toy kong! Would you believe that it had been missing for 18 months! It was probably hiding in Roxy’s stomach until one day it made its way into the intestines. Roxy’s owners knew she’d chewed the top off but assumed it was in the garden. They never considered that she could have swallowed such a large piece of rubber. 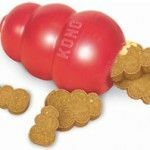 Kongs are often classed as an “indestructible” toy, so this story is a warning to all pet owners. Please be vigilant and check your pet’s toys often to check if any parts are at risk of breaking off. This includes stuffed toys – we removed the leg of a toy flea from our repeat-offender Snoopy’s intestine who had a sock removed just 2 months earlier. 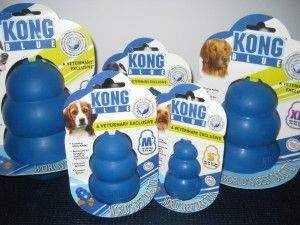 Vet HQ now stocks blue vet-grade kongs which have 25% more tensile strength and more importantly, show up on x-rays in case your dog outsmarts the manufacturers. Don’t take any chances – come into Vet HQ to buy the blue coloured kongs. It could save your dog’s life! We all know that veterinary care for illness and injuries can be expensive and unforeseeable. For all of Roxy’s care including the surgery, radiographs, intensive care overnight monitoring, medications, intravenous fluid therapy, hospitalisation and rechecks, her owners were $125.00 out of pocket. PetPlan insurance paid $6,175.75. Snoopy’s owners also had insurance. They covered both his sock and toy flea removal within the short period of time that they occurred. Pet insurance can help you protect your pet by facilitating the best medical care, all while providing you with peace of mind. We can’t recommend it more highly. At Vet HQ we organise your claims for you and do all the paperwork so you can avoid the hassles. If you haven’t taken out insurance for your pet, please seriously consider it and contact us for a policy comparison table or for more advice.